An interesting article has appeared on space.com. 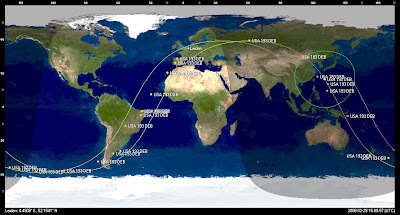 NROL-28, the launch of a new spy satellite by the NRO, has been delayed because the NRO doesn't want to risk it being hit by debris fragments of the destroyed spy satellite USA 193. Meanwhile, 12 more orbits have been released for additional fragments of USA 193 besides those released earlier. 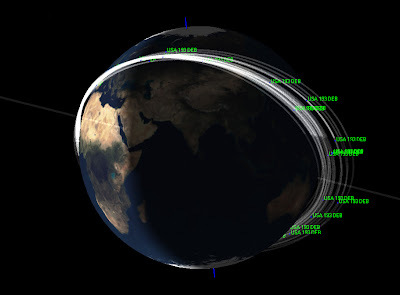 In my post here on the latter issue, I mentioned I could not provide graphics of the orbits. Since then, such graphics have appeared on a number of other websites, so I feel I do no harm in doing so too as it already has become public domain. 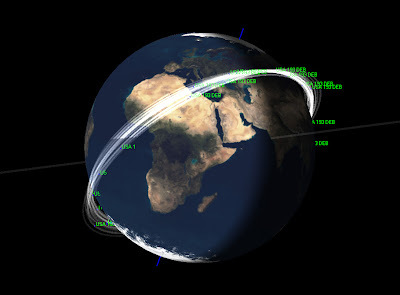 The following pictures show the orbit distribution of the created ring of USA 193 debris around the Earth in 3D, plus a ground map for this afternoon which shows how the fragments have spread along the full orbital extend by now.